The 2017 Toyota Prius Prime is a far, far better plug-in hybrid than its predecessor. It defaults to electric-only operation, it has 25 miles of EPA-rated electric range, and in electric operation, it is by far the most energy-efficient vehicle you can buy this year in the U.S.
And when it reverts to running as a standard hybrid car, it's rated at 54 mpg combined. All those qualities together make it an obvious nominee for our Green Car Reports 2017 Best Car To Buy award. We also measure the likely market impact of candidates for our award: supreme efficiency in a zero-emission vehicle is great, but if only a few hundred are sold, that vehicle is more or less irrelevant in the larger picture. The likely sales volume of the 2017 Prius Prime, which will be sold throughout the U.S. next year, weighs into its importance as well. 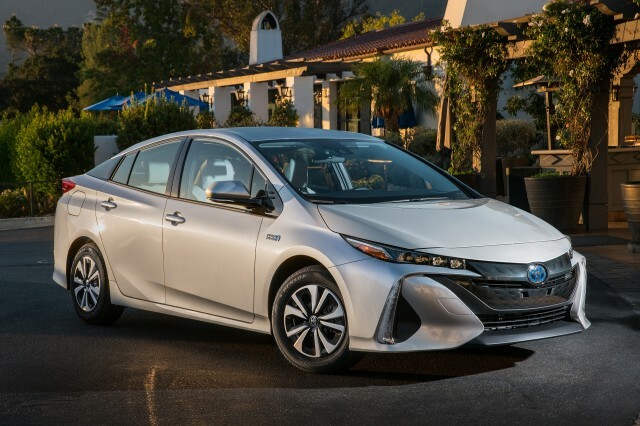 And we have to admit that part of the Prius Prime's appeal is the refreshing contrast it makes with its predecessor, sold from 2012 through 2015 and known simply as the Toyota Prius Plug-In Hybrid. 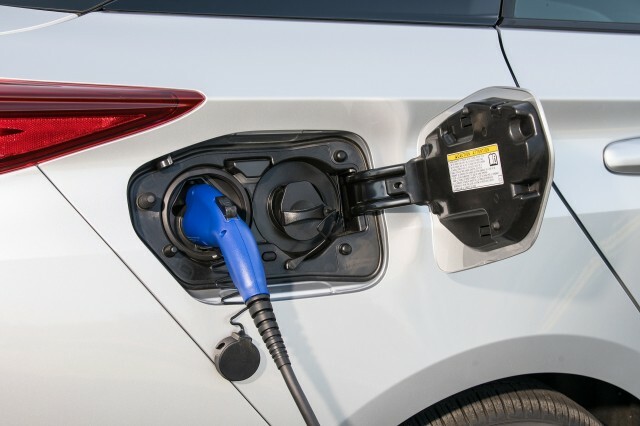 That car had a mere 11 miles of EPA-rated electric range, the lowest of any car with a plug sold in the U.S.
And the car's electric-only performance was so marginal that even on relatively gentle standard EPA test cycles, the first plug-in Prius could do only 6 miles before its engine had to switch on, despite having battery capacity remaining. 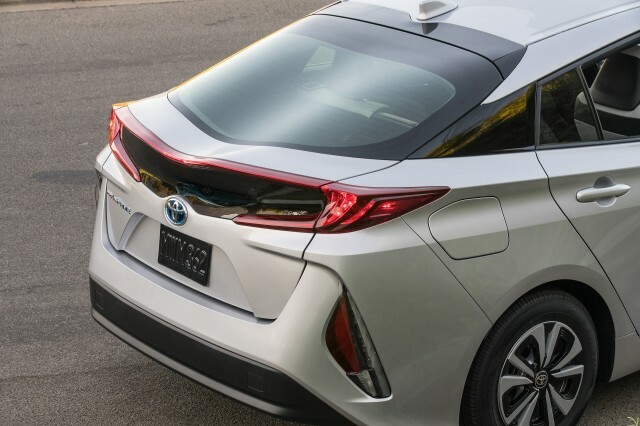 Granted, that generation of Prius Plug-In got the same 50-mpg combined rating as the conventional hybrid version—and shared that the bulk of that car's personality, both positive and negative. 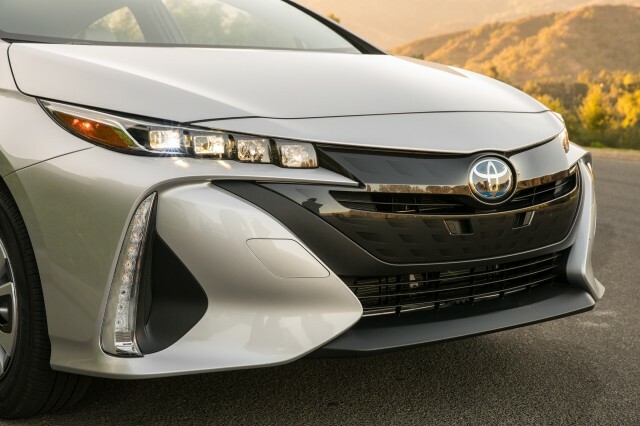 The Prius Prime, on the other hand, has different front and rear styling than the latest version of the conventional Prius hybrid. That includes a new front end, and a long rear with horizontally oriented lights and a visually interesting twin-domed rear window in the liftgate. Most reviewers have suggested that the Prius Prime is somewhat less startling in appearance than the regular Prius, which is probably all to the good. But more important, while it's far from fast, the Prius Prime is a perfectly decent electric car at speeds up to 75 mph. Like the fourth-generation hybrid that launched last year, the Prime is also far more "normal" feeling from behind the wheel than any previous Prius version. Its unusual dashboard will remind you it's a Prius, but the handling and roadholding no longer feel remote, disconnected, and Space Age-y. And that's all to the good. Our three Best Car To Buy candidates this year are remarkably different. DO YOU AGREE? Which green cars didn't make the cut for Best Car To Buy award? The Chevrolet Bolt EV is the first mass-priced electric car with more than 200 miles of range, the Prius Prime is a plug-in hybrid, and the Tesla Model X is a very expensive but striking all-electric crossover utility vehicle, the first one on the market. During 2013 and 2014, the previous plug-in Prius was one of the five best-selling plug-in cars sold in the U.S., some of that on the strength of Toyota's reputation for rock-solid reliability and the chart-topping fuel efficiency ratings of the Prius line. It's not unreasonable to expect the same of the Prius Prime—and it's a vastly better car to boot.